One of the first landmarks designated in New York City, preserving Sailors’ Snug Harbor required years of sustained commitment on the part of individuals, cultural organizations, and public servants. Sailors’ Snug Harbor was established by Captain Robert Richard Randall as a “home for the aged, decrepit and worn-out sailors” and consisted of 40 acres of Greek Revival dormitories dating from the 1830s to 1880s.2 The dormitories were designed by Minard Lafever and Richard P. Smyth, and the chapel was designed by R. W. Gibson. Until the late 1960s, the home was supported by income generated from prime real estate rent on the north side of Manhattan’s Washington Square. Five Greek Revival buildings (Buildings A, B, C, D & E), were designated New York City Landmarks in 1965. In addition, the Veterans Memorial Hall and Sailors’ Snug Chapel were also designated New York City Landmarks in 1965. Sailors’ Snug Harbor was designated a National Register Historic District on March 16, 1972. Furthermore, the Perimeter Iron Fence and North Gatehouse of Sailors’ Snug Harbor were both designated New York City Landmarks in 1973. The interiors of both the John J. Marchi Exhibition Hall: Building C, and the Sailors’ Snug Harbor Chapel was also designated New York City Interior Landmarks in 1982. The site is now called the Snug Harbor Cultural Center and is home to the Staten Island Museum run by the Staten Island Institute of Arts and Sciences. 1965: Five Greek Revival buildings (Buildings A, B, C, D & E) are designated New York City Landmarks. In addition, the interior of the John J. Marchi Exhibition Hall, Building C; and the Veterans Memorial Hall, Sailors’ Snug Chapel, are also designated New York City Landmarks. 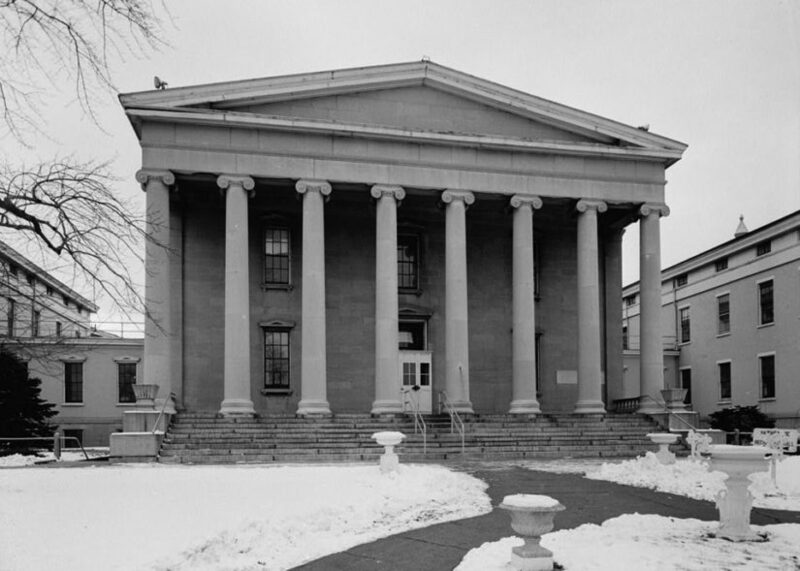 March 1967: The New York State Supreme Court rules that designation of the buildings of Sailors’ Snug Harbor constituted an "unlawful taking of property without just compensation." The New York Appeals Court would reverse this decision in favor of preserving Sailors’ Snug Harbor. The Greek Revival buildings in Sailors’ Snug Harbor were among the first 20 sites to be designated by the New York City Landmarks Preservation Commission (LPC).3 Along with the designation came a one-year grace period for the buildings that gave the New York City Landmarks Preservation Commission time to devise an alternative plan for the buildings at Sailors’ Snug Harbor. Sailors’ Snug Harbor sold 65 acres of the campus to a developer and the City of New York purchased the 15.4 acres of the property in September 1973 for $1.8 million. The Sailors’ home was relocated to North Carolina.13 However, the preservation of the buildings in the Snug Harbor Cultural Center hit a snag due to the mid-1970s fiscal crisis.14 In July of 1976, Jacqueline Kennedy Onassis generated publicity for Sailors’ Snug Harbor when she visited as a representative of the Municipal Art Society.15 In 1976, Sailors’ Snug Harbor began restoration to transform the home into the Snug Harbor Cultural Center. Carolyn Pitts, Sailors’ Snug Harbor National Register Form: Prepared for the National Park Service – Historic Sites Survey, 3 August 1976. Farnsworth Fowle, “First Official Landmarks of City Designated,” The New York Times, 7 November 1965, page 37; Thomas Ennis, “Disputed Landmarks,” The New York Times, 7 November 1965, page R1. Thomas Ennis, “Disputed Landmarks,” The New York Times, 7 November 1965, page R1; Russell Kirk, “At Last, Rescue for Landmarks,” Los Angeles Times, 21 December 1965, page A6. Gregory F. Gilmartin, Shaping the City: New York and the Municipal Art Society (New York: Clarkson Potter, 1995). ”Snug Harbor Saved by Court Decision,” The New York Times 23 March 1968, page 21; Gregory F. Gilmartin, Shaping the City: New York and the Municipal Art Society (New York: Clarkson Potter, 1995), pages 376-377. ”Snug Harbor Saved by Court Decision,” The New York Times, 23 March 1968, page 21. Gregory F. Gilmartin, Shaping the City: New York and the Municipal Art Society (New York: Clarkson Potter, 1995), pages 376-377. ”All Snug in the Harbor,” The New York Times, 16 February 1971. Gregory F. Gilmartin, Shaping the City: New York and the Municipal Art Society (New York: Clarkson Potter, 1995), page 377. ”City is Purchasing Five S.I. Landmarks From Snug Harbor,” The New York Times, 23 February 1971. Mayer Liebowitz and Michael Evans, “Snug Harbor Tract Bought By City as Center for Arts,” The New York Times, 23 September 1972, page 35; Walter H. Waggoner, “Surrogate Approves Relocation Of Sailors Snug Harbor to South,” The New York Times, 14 November 1972. Wendy Schuman, “Snug Harbor Faces Cash Shortage as Cultural Center,” The New York Times, 6 June 1976, page 1; “Snug Harbor,” The New York Times, 22 June 1976, page 34. Edith Evans Asbury, “Jacqueline Onassis Goes to Snug Harbor,” The New York Times, 31 July 1976, page 17. “Snug Harbor Restoration,” The New York Times, 9 February 1992, page R1.